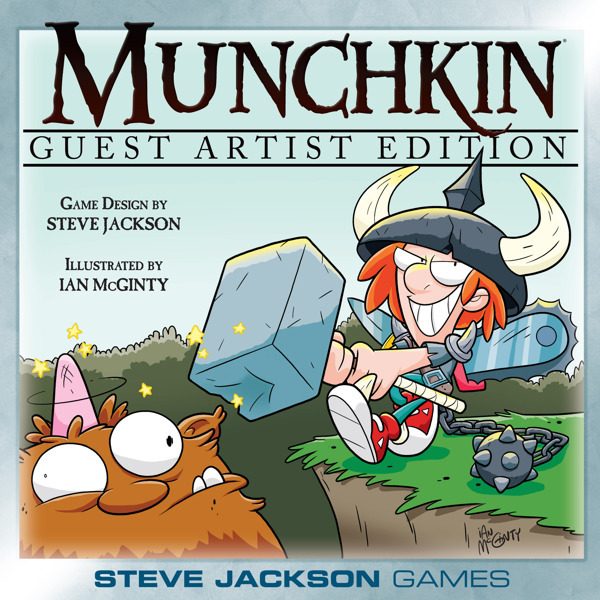 Today, we have a brief interview with Ian McGinty, the illustrator for the Munchkin Guest Artist Edition. Q: Ian, thanks so much for taking a few minutes to chat with us. Can you tell us a little bit about how your illustration style has evolved over your career? A: Absolutely! My style started as a fairly basic copy-and-paste job of old newspaper comics: Calvin and Hobbes, The Far Side, Garfield, that sort of thing. I read them all and traced characters, cutting them out and pasting them on paper to make new stories. I didn't really think much about comics again until around high school when I got very into Jhonen Vasquez's Johnny the Homicidal Maniac and SQUEE! comics; these were comics that had heavy lines and extreme angles, black and white art, and combined cute characters with extreme gore and disgusting monsters and all that awesome stuff. Later, working on properties like Adventure Time, Bravest Warriors, and Steven Universe really refined my art, taking it into a direction away from heavy inking and more focused on enhancing the color and designing unique characters. So, to quote a friend, I have a "natural talent of combining disgustingly cute and disgustingly disgusting." 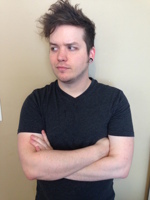 Q: Talk to us a little about re-illustrating a classic game like Munchkin. A: Gotta say, one thing I'm very excited about is seeing my twists on the puns of Munchkin. The great thing about the monsters and weapons is the wordplay, and I was able to do my own take on them. Switching things up and messing with the already established cards was a blast, and I was able to contribute my OWN two cards, how cool is that?! [Editor's note: These will be available as promo cards early next year.] And that's what I'm really MOST excited about. I was able to make up a Curse card and a Monster card: Grin and Tonic will be affected by any player that has a drink on the table and the BEST, and this is amazing, is the Nexus Demon, a monster from my own comic and animated show, Welcome to Showside. The Nexus Demon has some amazing abilities I won't spoil for you now, but it was great to connect my own creator-owned material to Munchkin and SJ Games in general. Q: You are the illustrator for the Munchkin comic books from BOOM! Studios. Did you find it easy to adapt your personal style to the world of Munchkin? A: I do actually, and more-so it's just plain fun! For the Munchkin comic books, I do go a lot more, hmm, "Looney Toons," I guess is the best way to describe it. I really stretch and manipulate the characters, go extreme on the facial expressions and play with the background elements a lot. Munchkin is inherently comedy, which is my favorite, and that gives me a lot of freedom to play, so to speak. I've never felt restricted doing the Munchkin comics, and that's extremely rare and extremely awesome. I do genuinely love the card game as well, which helps a lot, and I'm excited to be considered part of the mythos and family. Thanks so much to Ian for his insightful answers. 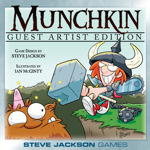 Keep checking back here for new information about the various Munchkin Guest Artist Editions!